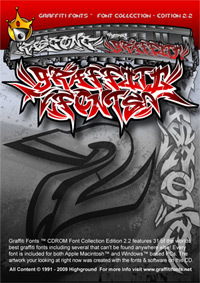 The newly updated Graffiti Fonts™ 2.4 collection is available in digital download and CDROM formats. 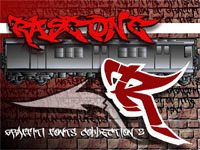 This collection includes: 36 fonts in all with 11 new exclusive graffiti fonts and new styles from 3 developers. This new CD includes every font featured in our 2.2 Collection for both Apple™ and Windows™ users. All 36 fonts are included in Open Type (.otf), True Type(.ttf) & Mac True Type format for use on any Windows, Mac, or Linux computer. We have included every font from GF1 & added several new ones. These fonts have been upgraded & kept up to date since GF2 was originaly released in 2004. You can see all of the included fonts listed on the right side of this page. Click on any font to view more images & details. Edition 2.2 also includes an array of free graphic design, web design, office & 3D applications so anyone can use the fonts to create advanced artwork with no additional software. Click here to view a simple demo / tutorial showing the fonts and software on this CDROM in action. Scroll down to view the the full list of all included fonts and software. This CDROM also includes JF Draw™, (New) a simple vector drawing application with which you can create everything from technical drawings to logos, use fonts, add text to images and more. 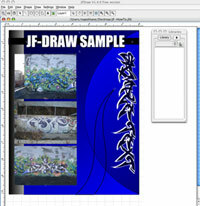 Note: Highground has created a basic tutorial / demo that introduces the basic use of Vector Graff to create digital graphics. 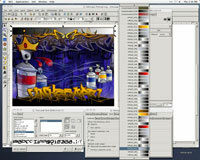 If you do not have expensive design software Vector Graff can often get the job done. The Opcion 1.1 Font Manager (included) runs on virtually any Windows, Mac or Linux operating system and can even run right from this CDROM or any disk. You can use Opcion to preview installed or uninstalled fonts from anywhere on your computer. As an additional bonus we have included a few dozen basic and decorative fonts which will run in GIMP, JF-Draw, Opcion and any other application that uses fonts. 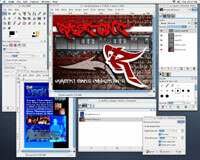 • Use fonts, clip-art, photos, & original artwork together to create graphics and animations. 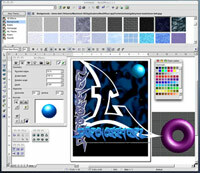 - GIMP™ is a bitmap graphics application similar in operation to Adobe PhotoShop™. Working with this software you have access to all the FONTS installed on your computer. You will be able to create and edit images using layers, magic wand, filters, patterns, painting tools, effects and a ton of other familiar tools. This advanced vector drawing application similar in function to programs like Illustrator, Corel Draw, Freehand and others allows complex drawing, color, layout & font work. Easy to use and very powerfull, Inkscape imports & exports most vector & bitmap file formats. Full versions are included for Mac, Windows & Linux. OpenOffice consists of 6 high quality applications in all. First developed by Sun Microsystems™ then released as open source,this suite includes a vector drawing application, a word processor, an html editor and a lot more. Libraries of clip-art & web objects are included and available to drag & drop into all 6 applications. Create custom 3D objects, text, environments or artwork and export your work to a variety of popular formats. 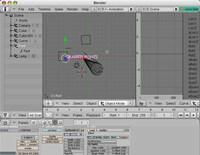 Blender works with TrueType fonts and contains a wide array of 3D effects.